Since we are at the start of another year, I thought it would be appropriate to review some "year-round" books that focus on seasonal eating. 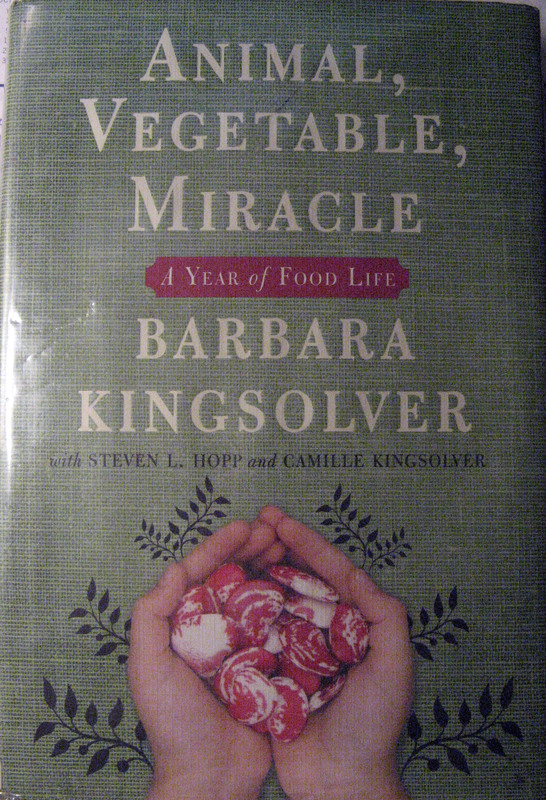 Animal, Vegetable, Miracle - A Year of Food Life by Barbara Kingsolver is a fascinating read about one family's adventure to eat only what they can grow, or purchase locally, for one year. The book is arranged chronologically, beginning in March when the first tender shoots of asparagus appear. The story continues as their garden is planted and the family begins to harvest the fruits of their labors. It's fascinating to read about the quantities that were necessary to actually feed a family of four for a year, and of course all the hard work that goes into such a venture! Each chapter ends with several seasonal recipes, written up by Barbara's daughter, Camille, and reflecting food that is eaten in the Kingsolver household. For those interested in seasonal cooking, this book shows you where it's really at. Obviously most of us can't take the drastic measures the Kingsolver's did, but the book does open one's eyes to many things, remind us of what is in season when, and encourage one to take a few baby steps in the right direction. I chose a recipe from the chapter entitled: What do you eat in January? 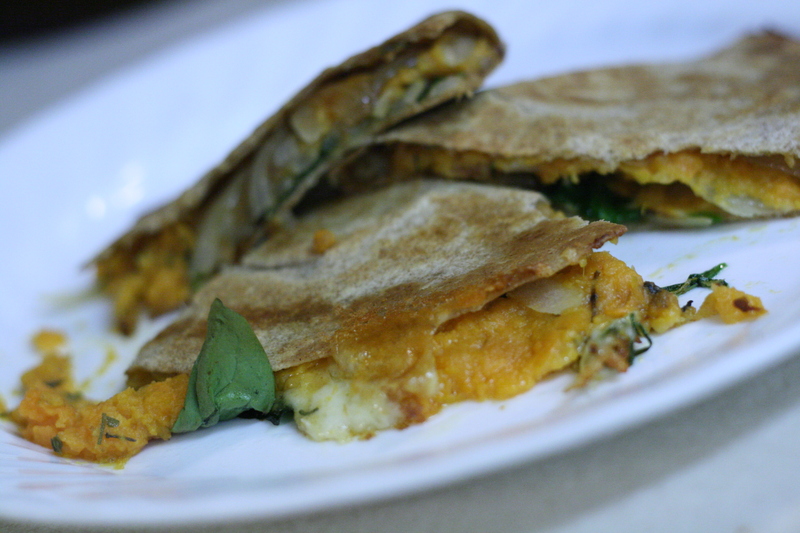 The Sweet Potato Quesadillas were a nice idea, although, funny enough, I think I would prefer them without the sweet potatoes and just the onions, greens and brie. Cut sweet potatoes in chunks, cook in steamer basket until soft, then mash. Chop and saute garlic and onion in a large skillet. Add spices and sweet potato and mix well, adding a little water if it's too sticky. Turn burner to low to keep warm without burning. Preheat oven to 400F. Brush oil lightly on one side of tortilla. Turn over and spread filling on half of each. 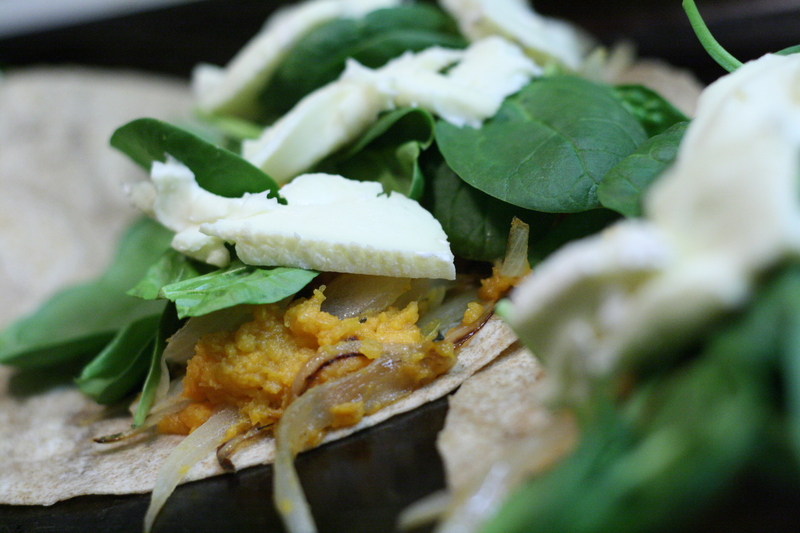 Top with slices of Brie and shredded greens, then fold tortillas to close (oiled side out). Bake until browned and crisp (about 15 minutes); cut into wedges for serving. 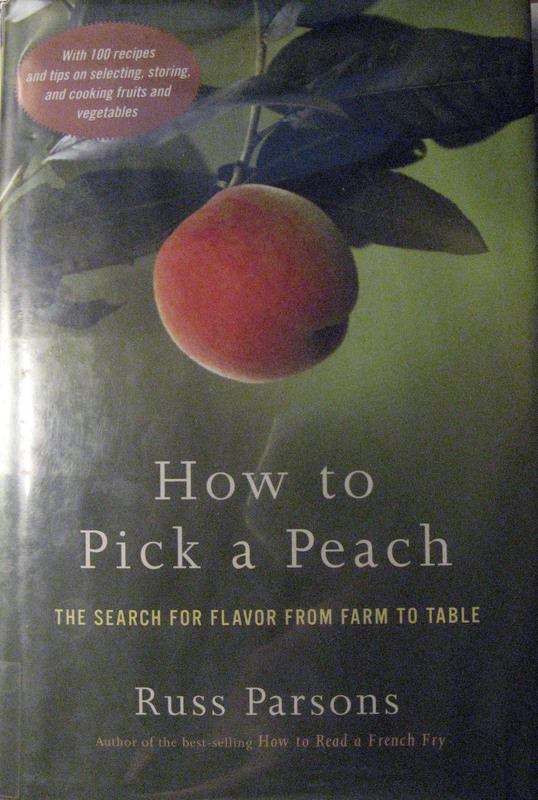 How to Pick a Peach - by Russ Parsons is a fascinating and helpful book that surveys the fruits and vegetables available in our markets, giving their genetic history, storage and preparation information, and suggested recipes. The books is arranged seasonally beginning with spring and its produce: artichokes, asparagus, onions, leeks and garlic, peas and fava beans, salad greens, strawberries. The book closes with a large section on all types of citrus (so check this book out if you want to know more about what to do with the glut of citrus in the market right now!). I found myself fascinated by the statistics of how many tons of what vegetable are grown in which states. And then to trace back the genetic history to find out just how we got tomatoes that look so red but taste so white in our stores today. There is also a full explanation of why strawberries no longer taste like the berries I remember as a child. I found the refrigeration instructions helpful too. For instance, you should never refrigerate bananas, potatoes, onions and tomatoes. You can refrigerate briefly (3 days) cucumbers, eggplants and peppers. And, only after fully ripened can you refrigerate avocados, peaches, plums, and pears. There are quite a few recipes in this book as Parsons provides recipes for each fruit or vegetable talked about. 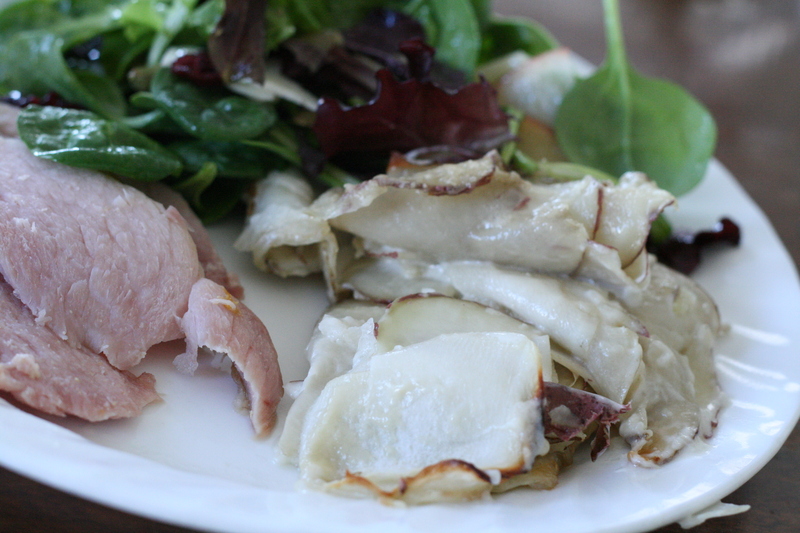 I chose to try the Turnip and Potato Gratin.The idea of the dish was very nice, but I felt my turnips were a bit too spicy and would have done better with allowing the potatoes to be the main ingredient and the turnips just the sideline. Heat the oven to 450F (I did 425F for my oven). Rub the garlic clove all over the inside of a heavy gratin dish, then butter the dish well and set aside. Discard the garlic. Slice the turnips and potatoes as thinly as you can, ideally using a mandoline or Japanese slicing tool. 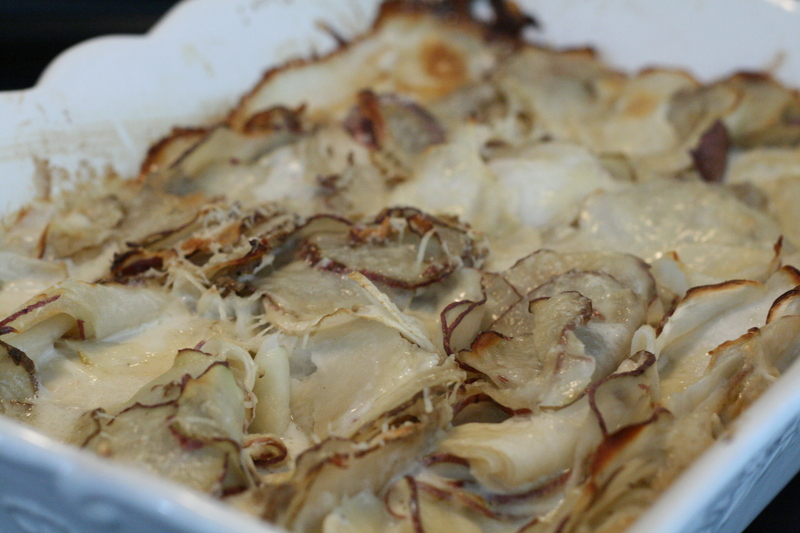 Toss the vegetables with the salt and place them in rough layers in the gratin dish. Don't worry about arranging them; you'll be stirring them later. Bake until softened, 20-30 minutes. Stir with a spatula every 10 minutes, making sure the bottom layer doesn't scorch. Pour the cream over the potatoes; it should come just to the top layer without covering it. Distribute the cheese over the top and bake until the cream thickens and the top is browned, about 30 minutes. Serve hot. I am reading Animal, Vegetable, Mineral right now and I love it. It is such an inspiring story for those of us that want to change our habits to eating locally.